We are officially into the second month of the year, so I think it’s fair to ask the question of all questions…how is that weight loss resolution going?? 😉 I joined a gym last month, which has been different for me since I’ve either had a free membership through the Air Force base or it was warm enough to run outside while living in California, but I have to be honest – it has been so amazing! I love getting a good burn in every day. Working out isn’t my struggle though. Eating is. My day usually starts out really well. I’ll make myself an egg white omelet or some steel cut oats, but by the middle of the day, I feel like if I don’t get some sugar in my system, I really might die! This was the case last week. Zach and I were grocery shopping and I told him I needed a root beer float, STAT! He, being the nice, supportive husband that he is, suggested that rather than hopping myself up on sugar, we make a little snack that will curb my sweet tooth, while not killing my calorie count at the same time. That’s where these babies enter in. They’re simple to make and are only 25 calories a pop! I plan on keeping these in my freezer at all times for when those sugar rushes strike. Cut the bananas into 1/2 inch, even slices. In a medium sized bowl, combine the chocolate and oil and microwave on high for 30 seconds. Stir the chocolate and then microwave in 15 second increments until the chips are fully melted. Place a piece of wax paper on a baking sheet. 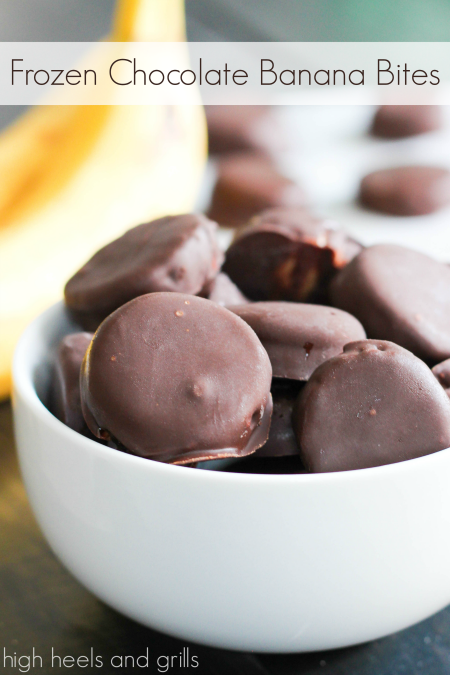 Dip the bananas in the chocolate and place on the wax paper. Place bananas in freezer for at least six hours or overnight until frozen. I hope you enjoy these little goodies! They’ve become one of my new favs! Yum! These look delicious – they’d make the perfect treat on a hot day. Thanks for sharing the recipe! Sounds like a quick, satisfying snack! I typically make a smoothie in the morning with chocolate instant breakfast powder and bananas, but wouldn’t have thought of making these. I love bananas and chocolate. I bet they taste even better frozen. I did exactly as the recipe states, but ended up with coating the banana slices with thick chocolate. It was impossible to dunk. I added more oil and that helped briefly. So then I tried to warm it up again, which again helped briefly. However, I was never able to actually ‘dip’ the slices. So…we will see how they turn out. Not as if they could turn out badly. Any chocolate and bananas is going to be good! I agree, I had trouble getting the chocolate to stay on the banana even after adding more oil and reheating the chocolate a few times. I wish I had read the comments earlier, I would have used coconut oil instead. I wished I had read the comments too. Mine did the exact thing. It was rough trying to dip. I am sure none will get wasted. Can you use something other than vegetable oil? Coconut oil would be much healthier! This is pure brilliance! I am the same way! the debate has now started – I saw the banana cancels out the chocolate so I can consider this a healthy treat. Hubby says the chocolate cancels out the banana and it’s just candy. 🙂 Either way, I’m totally making them! These are so awesome! I did have a hard time with the chocolate after the first 5 or 6 bananas. It didn’t really help it to reheat. It helped to add more oil and reheat a little bit. Maybe next time I could try a double boiler? Either way they are SO delicious and I’m not super fond of bananas. Makes you feel better about eating something sweet lol Thanks for the great recipe!